Ariana Grande fans are freaking out. Grande recently posted a couple of photos on Instagram where she is wearing a bright and shiny ring on her left ring finger, AKA the engagement/wedding finger. 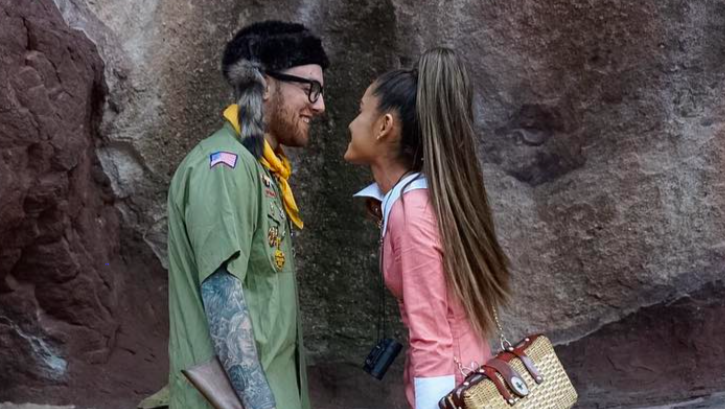 Her followers think she might be engaged to her beau, Mac Miller! Hmm, interesting! It could just be a ring, though, right? Either way, we support Ariana and Mac’s love. Look how cute they are! Mac gushed over Ariana just a few months ago in an interview with Billboard. He says of his relationship with her, “That is a true thing in my life. She’s amazing.” He also said that he’s “just a man in love.” Aww. Adorable. But let us not forget that Ariana is notoriously private about her personal life. Remember when she told off Ryan Seacrest for asking about her relationship with Mac last year? She said during an appearance on On Air with Ryan Seacrest, “If I post something, that’s what I’m willing to share at that moment. That doesn’t mean then you, Ryan Seacrest, with millions of listeners are entitled to more information.” We can respect this. We’re just glad you’re happy, Ari!